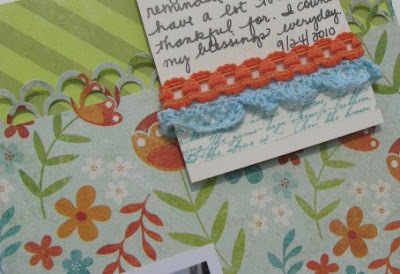 The June kit from Polka Dot Whimsy was fabulous this month! The colors were so "me" and the patterns easy to use and mix together. When I saw the paper from Simple Stories with numbers 1-26 running down the edge, an idea quickly came to mind for a page... I decided to list the things I love about Kevin. However, since my kit was missing the sheet of large alphabet stickers, I had to get creative with my title work. The kit included a card that said "10 things I love about you" so I added to that to total up to 26! I used some of the mini alphabets by My Mind's Eye that were included in the kit to mix in with my journaling. 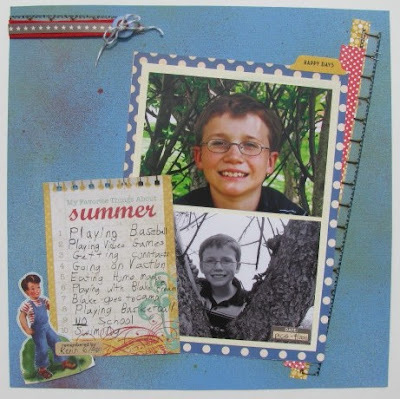 And, of course the kit had great "doo dahs" this month that I added here and there to accent floral elements on the papers. Not having large alphas really forced me to get creative. You know how I love my alphas! I was going to hold my kit until I received the alphas, but when I didn't get a reply from the club owner, I just got to work. I used "Fun" at the top of one of the bingo cards on the Simple Stories papers for part of my "Kitchen Fun" title. 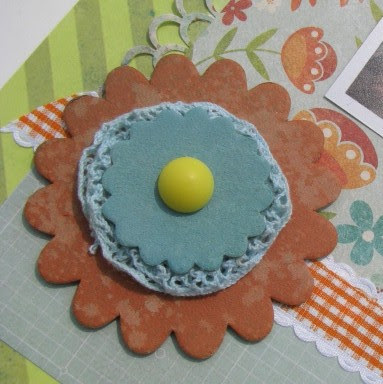 I accented my page with buttons and trim. I fell in love with the birthday hat patterned paper by My Mind's Eye and had just the photos to use with it from Kevin's birthday. I layered a couple of patterns on top of the red cardstock, inked the edges of the hat paper and jornaling card red and topped them with my photos. Since the mini alphas in the kit didn't match the papers here, I let the journaling card double as my title. I cut some hats out of leftover paper and layered them with pop dots to add some dimension. The ribbon is from the May PDW kit. 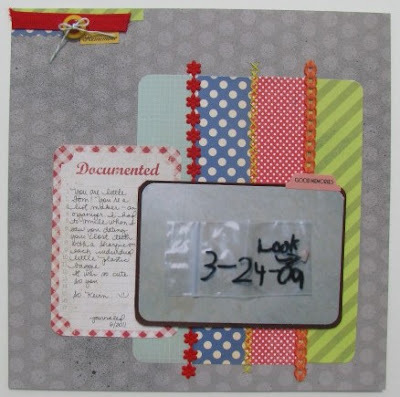 I peeled a strip of pink tape off the tag from the kit and replaced it with a couple strips of trim then used it for my journaling card. I misted the naked chipboard flowers in the kit with Mr. Huey Mists. I layered some trim between them and topped them with a "doo dah" from the kit. My final two layouts turned out to be my favorites. I mised the grey dot base with Mr. Huey mist and then topped it with strips of scraps. LOVE these colors together! Thanks for the "documented" journaling card, I didn't need to stress about not having large alphas for a title. I pulled a couple strips of trim to separate the patterns and did some hand stitching, too. For my final layout, I decided to "cheat" again with the title and use the heading of another journaling card - "My favorite things about summer." 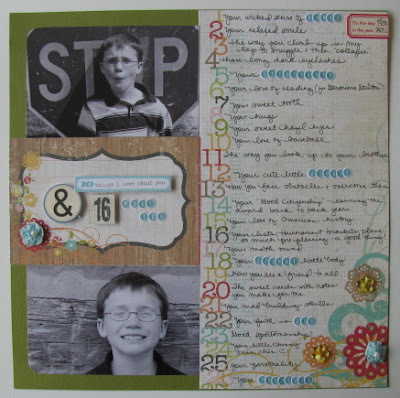 I asked Kevin to complete the card with his top 10 and then I finished the layout with scraps. Again, I used Mr. Huey mists (three colors) on my base paper. The grey twine is from a recent purchase - it's my new favorite color! I also added some tiny Tim Holtz staples to hold down the strips of paper and the film strip ribbon. And there you have my June projects - well, part of them. I finished SIX cards, too. Stay tuned for them. 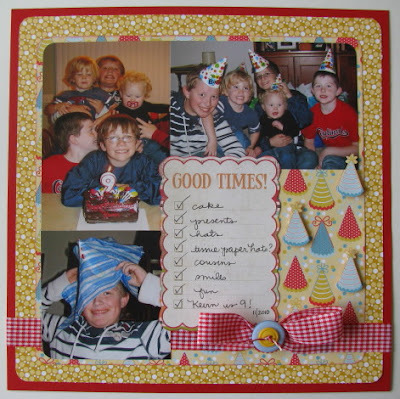 Great job with this kit Amy! It looks like a great kit to play with, off to check out the website! Your layouts are awesome! You have such nice handwriting too! Who's been scrapping?? Ms. Amy! Whoo Hoo, girl, you did some work on this kit. Can't wait to see your cards (did you say SIX?? )!